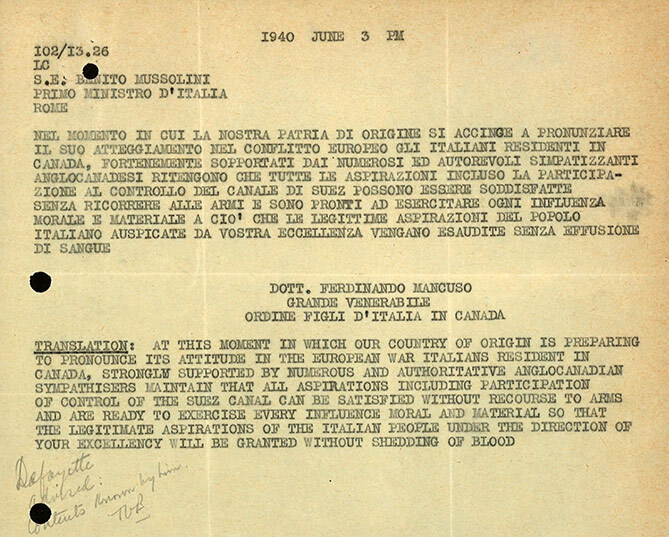 Translated telegram to Benito Mussolini from Dr. Ferdinando Mancuso, the Grande Venerabile, Order Sons of Italy. The telegram appears to have been sent on June 3, seven days before the declaration of war. A handwritten note in pencil at the lower left corner reads: Defayette advised: Contents(?) known by him [Initials]. Ferdinando and his brother Salvatore Mancuso were interned as threats to the Canadian state.